If Boho Chic is your kind of style then there is a 11-day summer pop-up event in London, which I think you might be interested in to visit. Organised by a statement boho British brand Snazzy they have collaborated with four other lifestyle brands to bring a truly amazing and inspiring retail experience. 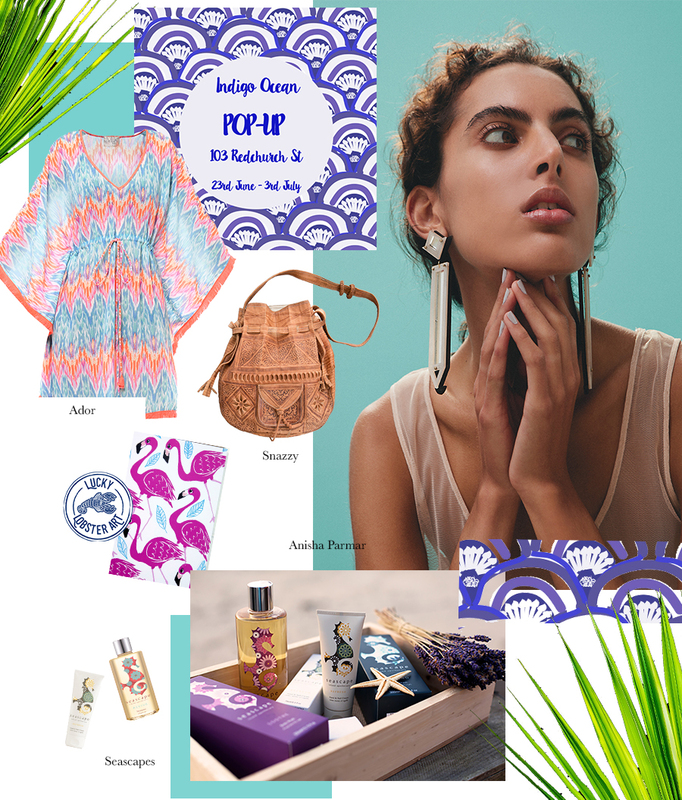 The Indigo Ocean shop offers lifestyle products featuring statement bohemian accessories, luxury kaftans, natural bath & body products and handcrafted prints. The London-based accessories brand that celebrates cultural diversity, tradition and artisan craftsmanship. Snazzy is the statement accessory brand for the free-spirited seekers of things hand-stitched with love. Inspired by the beauty of Britain’s beautiful coastline, award – winning British bath & body brand Seascape Island Apothecary features products and gifts for the whole family. Infused with a rich selection of essential oils, Seascape’s formulations are as natural as you will find in the marketplace. ADOR is a limited edition collection of handcrafted kaftans & scarves. Each piece is designed to link vibrant traditional artisanship with today’s contemporary taste. All of the products are made from safe and sustainable methods. Anisha Parmar London is an urban//ethnic, luxury fashion: jewellery & accessories brand that is inspired by the melting pot of multi-cultural London: A hub for diversity and cultural cross overs with true British culture. A gorgeous selection of linocut prints, stationery, tea towels and cards. All designs are created using traditional linocut methods in our Hertfordshire studio, fondly known as ‘The Lobster Pot’. The pop-up is open from today (23rd June 2017) until 3rd July 2017 at 103 Redchurch St, London, E2 7DL. Want to be part of a group of like-minded creatives that are going through what you’re going through? We have an amazing community of emerging designers, interior designers, stylists, fashion accessory brands, artists and photographers, where we help each other to grow. This is where I encourage sharing knowledge and brand collaborations. No fakes, self-interest liars and backstabbers are allowed. Please join us here.